Hand picked up red coffee cherries. Best Colombia Supremo Excelso 100% Arabica. Fermentation up to 14 hours to achieve amazing sweetnessand fruitness in coffee cup. From harvest to roasted coffee packing – not more than 10 days. 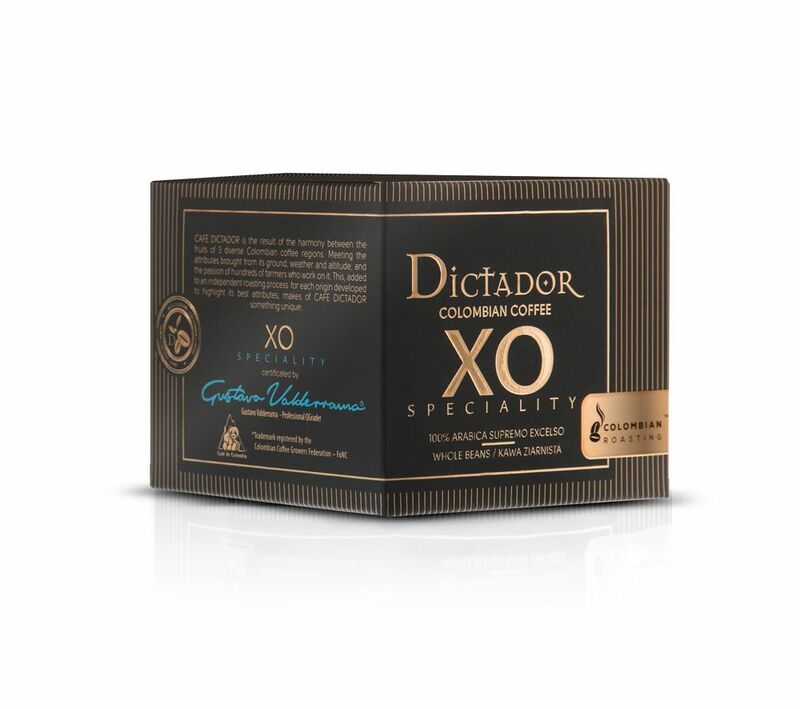 XO Speciality coffee has a highly-pronounced fragrance of white and bitter chocolate, with a strong chocolate and roasted hazelnut aroma. It offers medium acidity with herbal essence, and shows more pronounced notes of bitterness with traces of chocolate. It is a medium- bodied coffee with a prolonged after-taste. Magno has a highly-pronounced sweet and fruity fragrance, with a sweet aroma consisting of subtle chocolate and roasted hazelnut notes. Magno shows an optimum balance between acidity and bitterness with its creamy almond and sweet aftertaste. 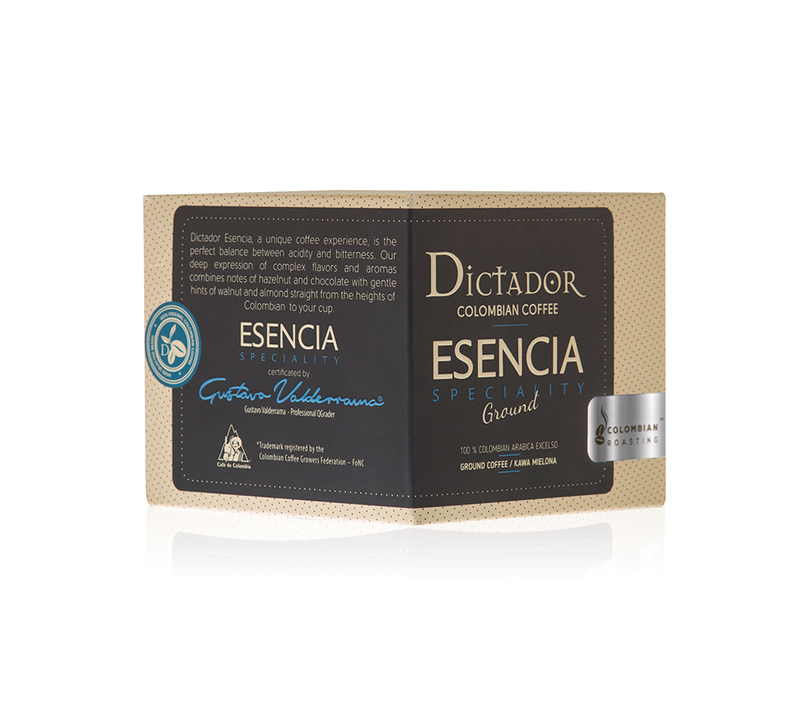 Dictador Esencia is a unique coffee experience, offering the perfect balance between acidity and bitterness. Our deep expression of complex flavors and aromas combines notes of hazelnut and chocolate with gentle hints of walnut and almond straight from the heights oF Colombian mountaintops to your cup. 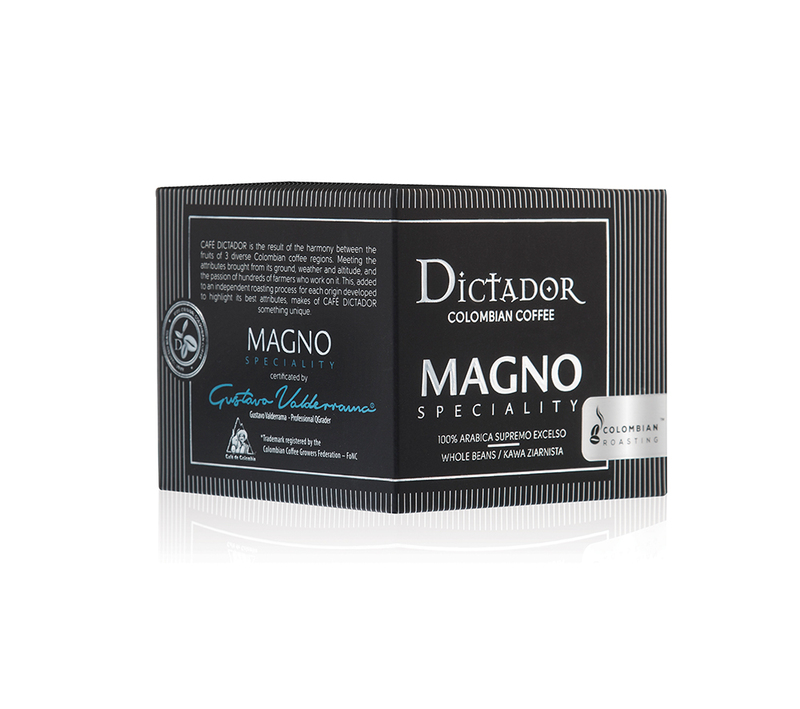 CAFÉ DICTADOR is the result of harmony amongst the fruits of three diverse Colombian coffee regions. It is the culmination of ideal coffee-making attributes of soil, weather and altitude, in addition to the passion of the hundreds of farmers who work the land. Each origin’s independent roasting process highlights the coffee’s best attributes, making CAFÉ DICTADOR something truly unique. Beneficjent: Dictador Europe Sp. z o.o. Nazwa projektu: Wprowadzenie do oferty kawy Esencia drogą do poprawy konkurencyjności firmy Dictador Europe Sp z o.o.